This is a great variation on chilli con carne, seen on Jamie Cooks Summer, and made up slightly as he didn't post the recipe. The best thing is the price of beef brisket - about £7.50 for 1.5kg, which easily feeds six with leftovers. Score the top of the beef into deep criss-crosses about an inch apart. Season generously with salt and pepper and rub in the cumin, paprika and oregano. Heat a pan with a little olive oil. Put the beef in scored-side down and sizzle for around 5 minutes on a high heat until it looks dark and well-sealed. Meanwhile, tip any excess spices into a large casserole dish, along with the peppers, chopped tomatoes, stock, cinnamon and bay leaves. Bring to the boil. Transfer the sizzling meat to the casserole dish, on top of the peppers etc. In the pan the meat was in, add the onions, garlic and chilli (and a little oil if it's dry) and cook until the onion is soft and it all has some colour (basically, until it looks like you want to eat it on its own!). Add it to the casserole dish and mix it all around, making sure the meat is well pushed down. Simmer over the lowest heat for four to four and a half hours. When it's done, you should be able to flake the meat easily with a couple of forks. Do that, and mix it all in, and there you have your chilli. Meanwhile, make the guacamole. Mash up the avocado and mix in the chopped onion, tomatoes, chilli and coriander. Add a little seasoning and spike with as much lime as you like - taste until it's nice. To serve, warm some tortillas in the oven. 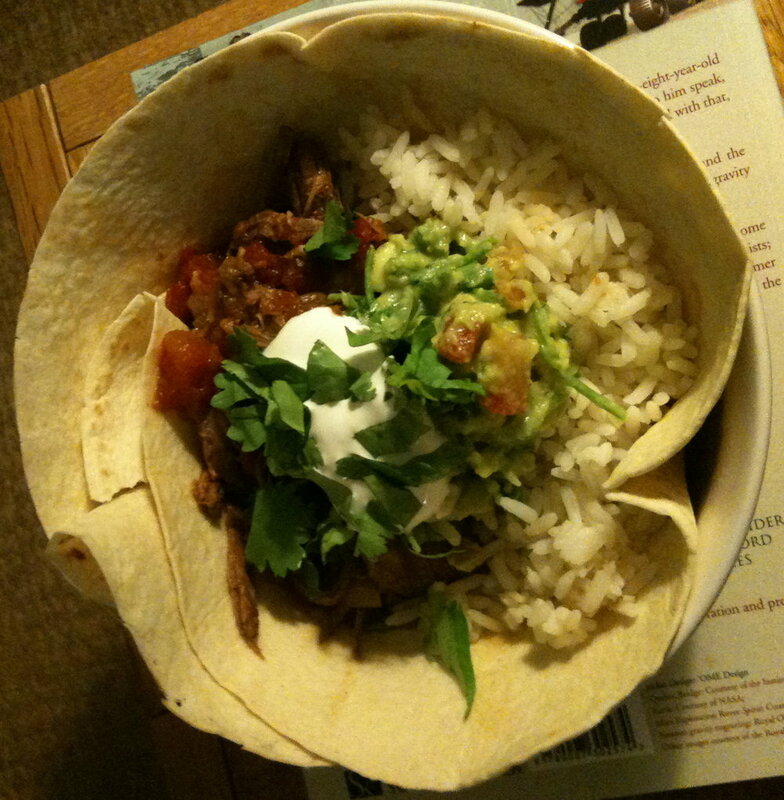 Line each bowl with a tortilla, then pile in some rice, chilli, guacamole, soured cream, coriander and a squeeze of lime. The tortilla gets all soaked in the juice - messy but tasty!